It’s all about goals. The beginning of the year is filled with goals and setting up your life for the next year. I have been so in love with reading all the end of year reviews and goals and resolution posts floating around the blogging universe the last two weeks. I love the excitement and enthusiasm that comes from reflecting on the past year and planning the year ahead. The problem is that I know that excitement is going to taper off as we get busy in 2015 and I want this year to be better. I want to blog better, be a better mom, a better wife a better friend, etc. So I was thinking we all need some motivation to stick with our goals through the year. I’ve been thinking a lot about how I’m going to keep up with things and put together a list of 5 tips to keep up your motivation from new years throughout 2015. 1. create new routines: I’m using my Google calendar more to stay on schedule. I’m also working on weekly and monthly lists for around the house so we can check off things as we get them done. Blake and I are going to start having sit down sessions to go over monthly budgets to keep us both on track. 2. Share my goals with others: I think this is so important to keep yourself accountable. I do this by being open with my family and husband. I also share it publicly with you guys here on my blog. My blogging goals and my January goals. This puts them out there and knowing other people know my goals helps me feel motivated to keep them. 3. Cut some of the non essentials: I was realizing that I was spending too much time watching TV and it wasn’t adding to my business or life really. I still watch TV on days in the morning that Blake doesn’t work, which is only a couple mornings a week. I also put on TV at night when I’m doing easy mindless tasks for my blog. That way I can still watch something and work at the same time. I also have focused on doing less social media unless it’s beneficial to my blog. I try to go on in the morning and like or comment on friends and families posts but not all throughout the day. 4. Make Monthly Goals: I mentioned this in my January Goals post as well. I like the idea of monthly goals over yearly goals for the most part. I do because I feel like a year goal can be too big and broad. What I want to achieve right now in January 2015 may not be what matters to me this December. A lot can change between now and then so monthly goals work better for me. 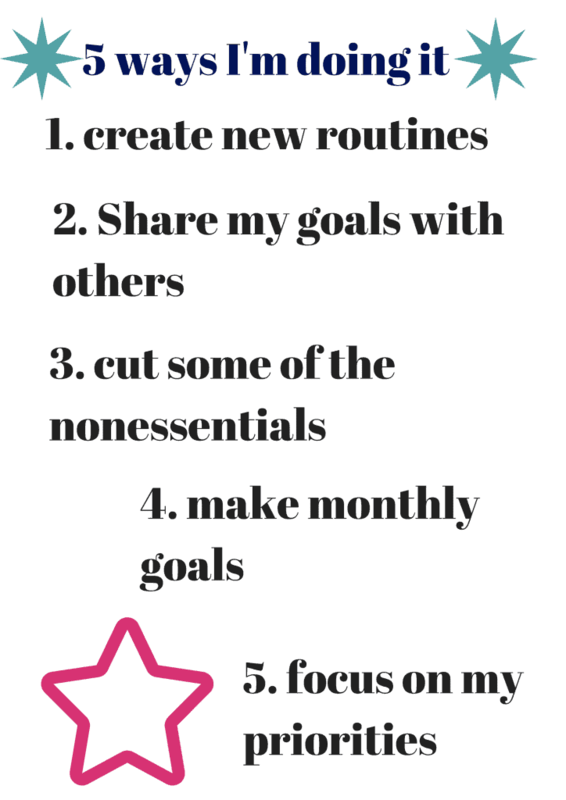 With my blogging goals for 2015 I am going to try to tackle one or two goals a month throughout the year. 5. Focus on my priorities: This was something I struggled with last year, I wasted a lot of time and didn’t put my focus on the areas of my life that are really important. So this year I want to keep my blog and growing blog consulting as one of the top areas of my life to focus on. That doesn’t mean I don’t have other priorities because obviously my daughter, Blake and doing things around the house are really important but if I want to keep growing as a blogger I have to make it a top priority in my life. So whatever goals that are so important in your life make sure you are spending the main chunks of your time on those top priorities. Great list. Number two is so important in helping keep myself accountable. Just sharing helps. All great tips. I would add to add some milestones so you can see your progress along the way. Great tips. My family should cut down on our TV watching — especially late night TV, so we can get more sleep! I really like the idea of making monthly goals around your resolutions. Breaking dow a big goal into more manageable pieces is always more likely to work for me. Cutting out distractions like TV or games is a big one for me. It’s so hard when you have limited time after work and you’re trying to cram everything in to a few hours. I know. I have days when distractions just happen but I’ve got back. Those are some great ideas. I definitely agree with sharing your goals with others, because then it’s some one to hold you accountable vs. just an idea in your mind. So far my goals have been on the top of my mind and I have been doing well at sticking to them! Best of luck to you with yours! I made some fitness goals and home management goals and I have a good plan for them, still working on figuring out blogging goals. Great tips! It’s so easy to make a list of goals, but super hard to stick with them! This will help! Love all of these ideas! Sharing my goals with others definitely helps me stay more accountable for them! 🙂 Thanks for sharing! Great set of tips and suggestions. I am trying to set up a better schedule myself. Changes are hard but they are beneficial. Thank you for sharing. Thank you for all your tips super helpful! Great tips! All will be helpful to me since I always forget and never follow through! Jeanine recently posted…8 Ways to Encourage Kids During Homework Time! This year I’ve broken my goals down monthly so I don’t lose steam as fast! Awesome tips! I didnt really set goals this year as much as dreams. Things I hope to accomplish. Take the rigidness out of a goal and makes it much easier for me to get to! #1 is one of my big goals this year. I want to keep track and get into good habits, and find out what works and what doesn’t so I can use my time and limited energy more wisely. i love these! I am working on even making weekly and daily goals. I’ve already broken half of my goals so I really needed to read this! We are only 10 days in, regroup and start again! I am already needing to refocus my goals. But I usually wait until after my wedding anniversary to begin any goals. I agree – sharing your goals is a great way to stay accountable! Love all these tips! love this. I stuck with my goals last year and am still really proud of what I accomplished. Good Job April I need to get better accomplishing goals! Great post! I am going to print this out and put it in my blogging notebook as a reminder to help me achieve my blogging goals! A Year is just too long! I’ve noticed sharing my goals with others is the biggest thing to continuously motivate me so I definitely agree with that one! Great tips. Simply scheduling time to work on the goal tends to help me. Get it girl! Can’t wait to follow your progress! I think just tying to have a great year is a good goal but not specific enough to fail at. I like the idea of sharing our progress with others. It makese us more accountable of our goals. Thanks for sharing these great tips. I think holding onto non-essentials is what’s holding me back from meeting my goals. There is so much I need and want to do that I am not leaving any time for my goals. Suzanne recently posted…My Thoughts on January’s Birchboxes! I like the “Share you goal with others”. That’s one way to keep me on track! Sharing goals with others is such a great way to keep yourself on track, I love that!